I just cooked a steak following Gordon ramsey's "perfect steak" method found on youtube, I flipped the steak every minute about 4-5 times on medium-medium high heat, but I couldn't get the internal temperature to go higher than 120 degrees F and I've always had this problem regardless of how I cook the meat. 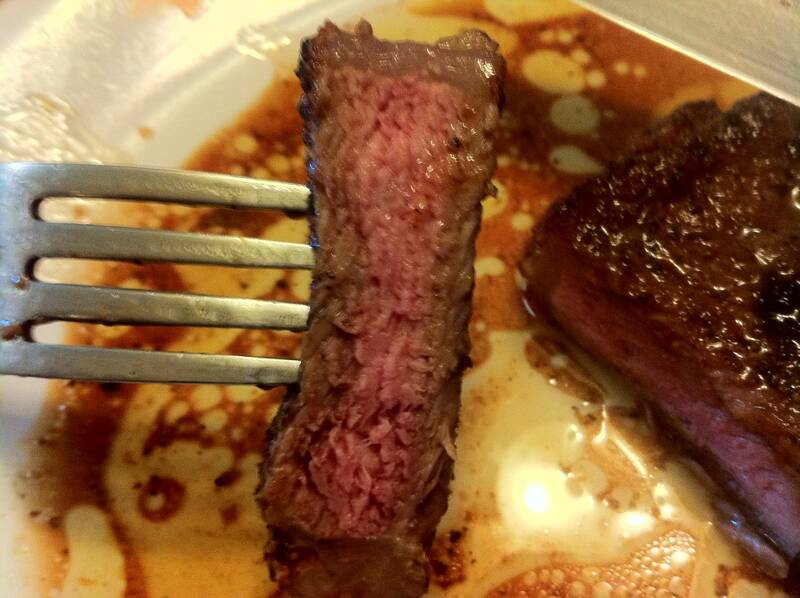 I'm including a picture of a cut from about the thicker part of the steak, it seems like it's medium-rare to me but again it only went to 120 degrees according to my thermometer which is a metal rod type thermometer. I should note, I let the steak sit out for about an hour before cooking so it could reach room temperature, after that I put it in a zip-lock bag and let it sit under hot water for a minute or two hoping to further increase the temperature so it would cook quicker, also room temperature in my house is about 70 degrees or so. I don't know what else to do, I don't want to eat completely brown steak, I did eat this steak despite the thermometer saying the internal temp only hit 120 and it was great, but nobody in my house but me would eat it like that. So any suggestions would be great. cut: not all steak cooks at the same rate. Really tender cuts cook faster than some of the tougher, more flavorful cuts, increasing cooking time by up to 50%. Cuts like tenderloin, filet, and loin (US) - Sirloin (UK) are more tender and cook faster. Denser cuts like sirloin, top sirloin, and bottom sirloin (US) and rump (UK) cook slower. If you are cooking a denser cut then you simply need to cook it longer. So my advice would be to get the pan hotter and cook it longer. Try adding one more minute per side. EDIT: @kenny says that he is cooking loin, so assuming it's 3/4", or 2cm thick and looking for medium done-ness I would cook the first side for 5 minutes and then the second side 3 minutes. The uneven times are to make sure it cooks evenly. So you need a total of 8 minutes cooking time. I don't do the flip every minute method because the uneven times work for me, and it lets me do other prep. Not the answer you're looking for? Browse other questions tagged temperature steak or ask your own question.